Hanoi (VNA) - Tien Phong Commercial Joint-Stock Bank (TPBank) has received 45 million USD from the Asian Development Bank (ADB)’s Trade Finance Programme (TFP), bringing the total to 75 million USD. The additional trade finance will help to considerably improve TPBank’s credit capacity in the market. Santosh Pokharel, TFP’s relationship manager, said the additional trade finance was decided after ADB reviewed TPBank’s details. TPBank General Director Nguyen Hung said ADB increased guarantees for TPBank by 2.5 times in a very short time, showing the foreign bank’s confidence in TPBank. 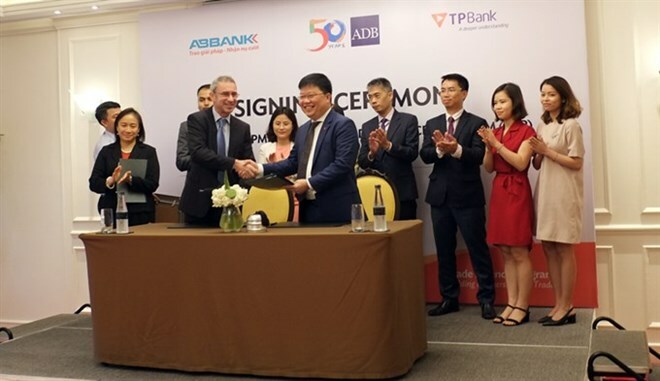 Earlier, ADB provided TPBank with 30 million USD on May 24. "The finance would help TPBank increase its presence in the international market, contributing to supporting its business customers to expand their transactions worldwide," Hung added. In addition to ADB, TPBank has been attractive to other foreign partners. Earlier, it received 18.3 million USD investment from IFC.